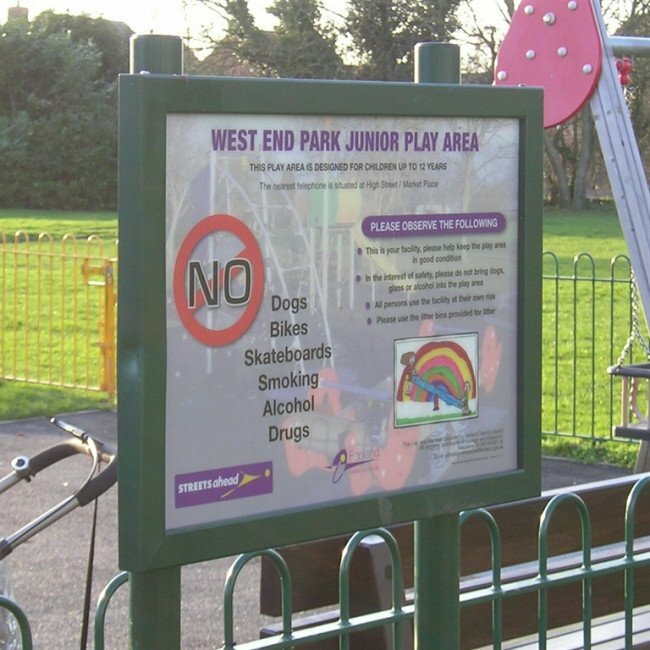 There is a legal requirement, under the Occupiers Liability Act 1957, 1984 to ensure that play areas have correct and adequate signage. Price on application - our straight forward ordering system will ensure your play area signage ticks all the boxes! Add our signs to your basket and our friendly, helpful sales team will contact you to discuss your needs. Name of operator of the site. Contact details to report damage or accidents. Where the authority has a permanent office this should include the telephone number. Where a clerk works from home the use of a telephone number may not be appropriate. Location of nearest public telephone for contacting emergency service (non essential). Where there are overhead electric cables nearby "No Kite Flying" signs are recommended. Where the play area is near a road the use of Road Signs to warn motorists of the presence of a playground should be considered (contact your local Highway Authority for provision of these). Any notices regarding age of users should be carefully worded so that is does not imply that the area is safe for all users of that age. For instance a 12 year old may have the mental and physical capabilities of a 3 year old. Something that implies that the area is safe for all children over the age, say, of 7, would imply that it was also safe for this child and could result in litigation in the event of an accident. The bold statement such as "This area is to be used by children Under 8 only" is to be preferred.